Last week, using your tax dollars, Senator Brian Burston posted the below letter to school principles in NSW. 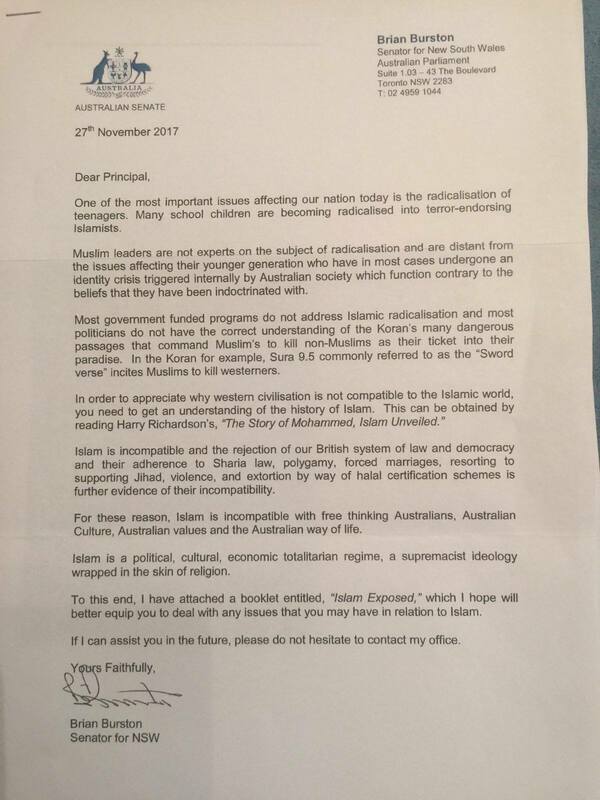 The letter is blatant anti-Islam propaganda and places Australian Muslim students at peril of being harassed and discriminated by their teachers and administrators and bullied and abused by their classmates. Senator Burston’s behaviour is disgusting to say the least and is not appropriate in the slightest for someone holding his office. His willingness to place our country’s children in danger should disqualify him from holding any public office. The officers of the Register will be writing personally to their local Senators calling for an investigation into Senator Burston’s abuse of power in using tax dollars and Australian Senate letterhead to spread hate speech and place our children in danger, and we encourage all of you to do the same. We must hold our elected officials to a higher standard.